The Indian mobile operators have slowly but surely started their 3G services across various cities of the country. Airtel was one of the most recent ones to launch them. Reliance is also rolling out their 3G services across various cities [Vote for the best 3G service providers !] To attract different customers, many of these operators are offering various schemes and plans for the esteemed ones. But Vodafone has done something unique – They have come out with a MiFi device, which according to me could really go on to become a hit amongst users as it takes care of nearly all the issues faced by Internet users. So what is a MiFi device? It is a wireless router which does the combined work of a modem, router and access point for the internet. Now that is some device, isn’t it? If you think of it, then it is more like a roaming wireless hotspot which provides net connection for five devices in the range of 10m at one time. The devices could include anything from a laptop to a netbook to a smartphone. How will the device function? The Vodafone MiFi device has a sim card slot. Once you insert 3G enabled SIM card into the MiFi device, you are done ! It will act as normal wireless router and you can connect your laptop / smartphone to internet wirelessly. Additional benefit to this is that being very portable you can carry it around along with you (it comes with 4 hrs battery backup). For Vodafone it is great because, a customer will have to buy a completely new Sim Card for such kind of 3G usage. Not only that, the internet usage with this kind of device will be very high, ensuring higher earnings for Vodafone itself ! The MiFi device aims to tap a growing segment of customers for Vodafone; the burgeoning segment which is always online on the move. This includes business executives who have a necessity of being online and young enthusiasts who frequently use social networking sites like Facebook and Twitter. There are always many problems with respect to accessing the Internet easily on the move. By offering to connect 5 different kinds of devices to the Internet in a small space, the MiFi offers a unique and fantastic benefit. The MiFi is compatible with all devices like PC, Mac, Linux, Android etc. This makes it a rather interesting buy as people use different kinds of devices in today’s world. For people with multiple laptops, phones etc. wanting to access the net without changing the sim, this provides a very painless way of accessing the internet. It also helps one easily manage in areas without 3G connection. The attractive and sleek looks of the Vodafone R201 device along with a speed of 7.2 Mbps and a 4 hour battery life with power charging options are all added bonuses. One can also make calls whether internationally or locally through this device. With a price tag of Rs 5,500 it is not really a cheap device… But if one is a technology freak, I am sure he / she will be ready to shell out some money for the advantages it is offering. It’s being said that Airtel is in the pipeline to bring out a similar device very soon. It will good if other service providers also come out with such devices, which definitely will bring in competition, and with it price will come down as well. 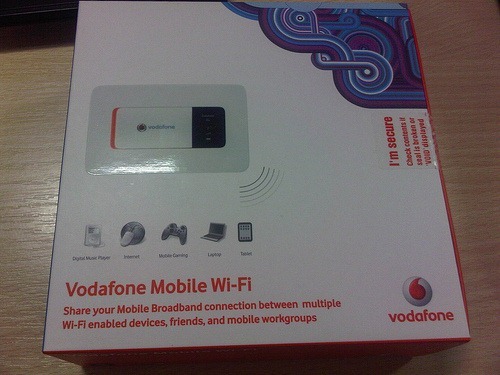 So, what do you think of Vodafone Mifi device ? Sorry, Laptop Not Allowed: Flights Will Soon Ban Laptops In Check-in Luggage! Imported zte mifi gsm or cdma sim can be used on it …ur regular sim with ur mobile plan…for 4000..u can thus use any possible operators sim in india..
hmmm ok I buy it 2mrw. Got one! Try it, definitely better than the rest. Looks like BSNL is better off … they’ve been having such a device “Yes” Optus, for the last few months …. and was costing us about Rs 5000/= then ….